The company has been operating bus tours in San Francisco since 1997, and in 2005 we took on the "City Sightseeing" brand, and imported San Francisco's first open-top double-decker buses from London. 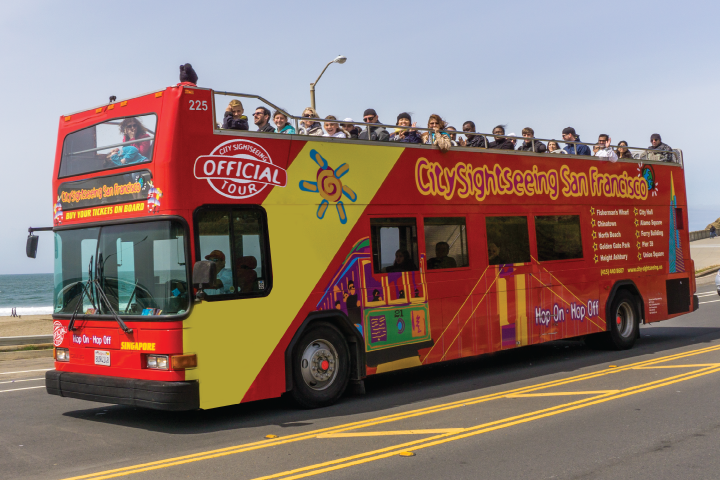 Today, City Sightseeing San Francisco is the largest sightseeing operator in San Francisco, carrying almost 1.5 million passengers in the last 5 years, with a fleet of over 20 open-top vehicles, as well as minibuses and vans. We operate a large variety of tours in and around San Francisco, and cover most of the most popular attractions. In San Francisco itself, we offer 4 different open-top routes, to offer you the most comprehensive tours of the city. Outside of San Francisco, tours include Muir Woods, Wine Country, Monterey & Carmel and Yosemite National Park. The worldwide brand "City Sightseeing" operates in over 100 cities all over the world, and was established in 1998 in Seville, Spain. An open-top Hop On Hop Off tour is a great way for you to explore a new city, or one which you just want to explore further. You'll get the best views of the sights, will have an expert and entertaining tour guide, and you can hop off the bus anytime you'd like to spend more time in a particular place. At our main office at 1331 Columbus Ave in Fisherman's Wharf, San Francisco. See our visitor information site for more information about San Francisco and other cities.